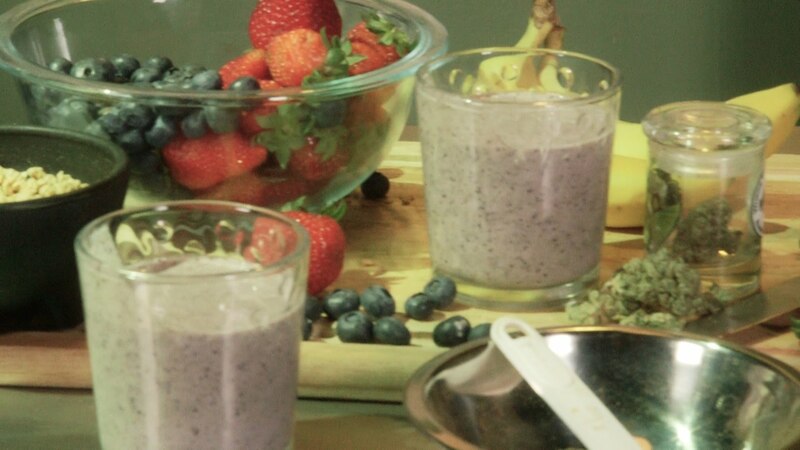 What better way to start your day than with a berry banana breakfast smoothie infused with your favorite cannabis strain? Put the ground cannabis flower in an oven safe bowl with a lid. Put into an oven on bake for [timer length=30]30 mins[/timer] at 325° F.
Times may vary depending on the amount, kind and current decarboxylation of the source material. Remove the cannabis when it is very aromatic and beginning to turn from green to nutty brown. Add your frozen banana to the blender hopper. Add the strawberries and blueberries. Add 1 tablespoon of ground activated marijuana. Put the top on the hopper and blend on high 20 seconds. Remove from hopper and add 1 tablespoon of yogurt. Return to blender and blend additional 10 seconds. It is highly recommended to use a NutriBullet, Ninja or some other high power, high speed blender to encourage bioavailability by breaking down the cell walls of the cannabis flower. Decarboxylate a larger amount of cannabis and store in a sealed container to use for daily smoothie/shake recipes. Put the ground cannabis flower in an oven safe bowl with a lid. Put into an oven on bake for 30 mins at 325° F.